A miniature satellite the size of a shoebox, called LightSail 2, will attempt the first-ever controlled sailing trip in Earth’s orbit, using a solar sail to harness sunlight for propulsion. 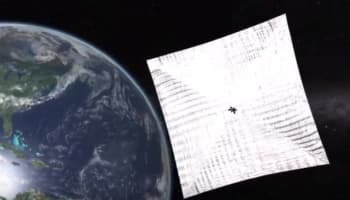 A solar sail harnesses the force exerted by electromagnetic radiation—specifically, sunlight—with a foldable reflective surface in order to move in space. NASA researchers estimate that sunlight transmits about 1.4 kilowatts of power per square meter in its journey from the sun to the Earth—which is minimal compared to the power of a rocket engine. But sunlight is an unlimited source of energy: if a sail is deployed long enough, scientists estimate that it could propel a spacecraft five times faster than conventional rockets. LightSail 2, developed at Purdue University, will be launched in early 2019 aboard a SpaceX Falcon Heavy rocket as part of an Air Force space test mission. Once in space, the satellite will be taken to orbit by a vehicle the size of a bar fridge, called Prox-1, which will detach from the Falcon Heavy. After a thorough diagnostic, LightSail 2 will then unfurl its solar sail—made up of four triangular segments that together form a square. With the sail deployed, the spaceship will have the size of a boxing ring. Cameras in the solar panels will monitor the sail’s activity. Then, like a racing yacht on the ocean’s surface, LightSail 2 will angle its solar sail to catch the rays of the sun at just the right angle—and will start to move. The sail can rotate edge-on and face-on to the sun during each orbit, giving the spacecraft the power to climb into a higher orbit—at a leisurely pace of half a kilometer a day. The team at Purdue will remotely control and track the CubeSat during its slow climb, comparing the data with a mission simulation to evaluate the satellite’s performance. “While there have been prior missions that deployed solar sails, LightSail 2 will be the first to change its orbital energy by controlling the orientation of the sail relative to the sun,” said David Spencer, associate professor in Purdue’s School of Aeronautics and Astronautics and LightSail 2’s project manager. Atmospheric drag will eventually overcome the tiny craft’s ability to gather sunlight for power, and the LightSail 2 will burn up as it reenters the atmosphere six to 12 months after sail deployment. If proven viable, LightSail 2 could create significant momentum for solar sail-powered spacecraft—something Carl Sagan advocated for back in the 1970s. Want to read more about potential uses for CubeSats? Check out Tiny Satellites Could Improve Climate and Weather Tracking.